ALL breed dog training for the family pet, along with advanced training for sport, protection & police. Biddable… a term that is thrown around quite a bit by dog breeders and trainers. What does that mean to you? To me, it means that the dog will care about its handler, will attempt to please its handler, and actually has an emotional tie to the handler. This dog avoids displeasing the handler, not only because of training, but also because of its social relationship with the handler. This is much different than the dog that has so much drive that it can only be trained through methods that employ electric collars (“my dog is so driven, I have to use three e-collars on high” mentality). 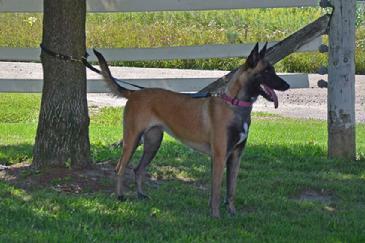 A dog that is selected on drives only can certainly be a high quality competition dog, or even police K9, if trained correctly, by the right handler. However, that almost mystical connection between a working dog and its master can be nonexistent if we only train and rely on drive manipulation. A perfect example of this is the difference in behavior in a highly biddable police k9 versus a drives only K9. Try this at your next training session, and see how your K9 fares….. In a building, chose a situation where there is a hallway, with an accessible room at the end, to the left or to the right. Before bringing your K9 in, place a protected (either suit or sleeve, or hidden sleeve if you want to really test) decoy in the room that is either to the left or right of the end of the hall. Bring your dog and another decoy into the building, and place the decoy at the end of the hall, just at the opening of the door. Place your k9 at the “head” of the hall, go normally down the hall, and turn into the room. Now, your dog is looking down the hall at a decoy, you are out of sight, with another decoy. Initiate a struggle in the room with the decoy you placed there, while the decoy that is “in sight” also does some mild movements, slapping of the sleeve, etc. Nothing too strong. Call for your dog. Does he “bite the wrong guy?” does he engage, then realize that you are in a struggle in the other room, and come to your defense? Can you call him from that first decoy? Now, if you did very good early training, your prey monster could actually do this very well. If you impressed upon him that all the fun stuff happens a lot more when you are under attack, and that you being under attack is a condition that he must respond to immediately, regardless of what he wants to do, you are all set. BUT…. As what happens often, we tend to want to see our dogs overcome all situations, to not think about self, to really not think about anything. Just go out there and bite, and self reward with that bite. The dog has no other thought than “MUST BITE”. There isn’t any modification.. no thought about proximity to handler, no realization that part of his family, his very most important person, is in trouble. The dog is blindly doing what he’s been trained to do, with possible tragic consequences for the handler. I am certain that there will be people that say “doesn’t matter to me... I’ll take care of myself.” Gotcha! If you only utilize your dog as a way to stop people from running away, and don’t care at all about physical attacks on your person, that’s great. Several of the protection sports are based on exactly that. 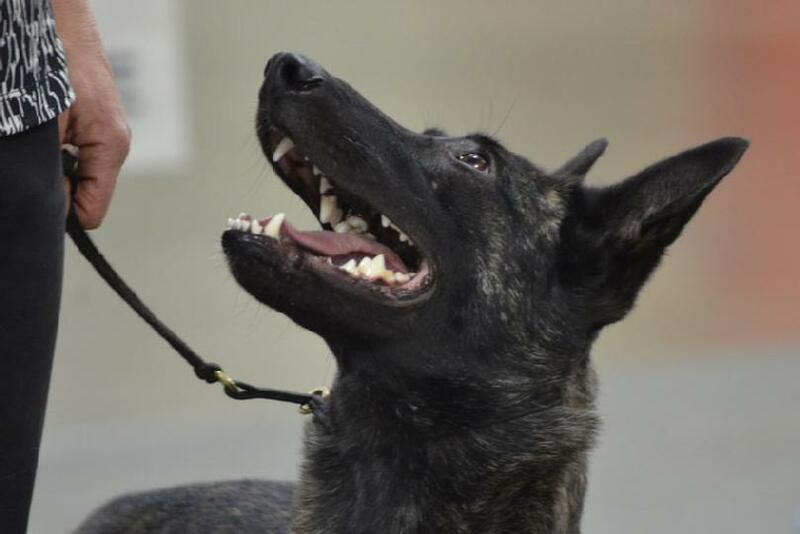 But a lot of us regular people got into this because we want a PERSONAL protection dog, and a lot of police K9 are expected to take care of their handler, as well as the rest of their duties. The departments that utilize my dogs are woefully understaffed, and the addition of a dog to a shift can really impact the safety and well being of not only the officers, but the general public as well. When you place a dog in a smaller department, that also needs the dog to be a P.R. type of animal, or if the dog is a part of someone’s family, you are still interested in that ability of the dog to bond, and to react with that bond in mind. A biddable dog makes a good handler look great, and a great handler look like they can do magic. These are the dogs that work stock as an extension of their handler, who instinctively “know” the difference between a good intentioned person, and a bad one. The ones that an agility trainer can “will” through the course, by simply thinking it through. Biddability is genetic, but can be enhanced by early training and handling. So, you’ve decided that you have a good litter, and besides the regular stuff (health checks on the parents, natural birth, normal litter behavior, good working pedigree) you now want to check for that elusive “biddability”. Choose the drivey pups… outgoing, bold, no threshold issues, bites deep and full on the puppy rag. Now, work them one by one. While playing with the rag, encourage him by voice, and touch. Does he bite deeper? Head shake? Wrap his body around the rag while you are fighting with him? When you release the rag, does he stand there, wagging his tail, as if to say “let’s do that again!”? Does he bring the rag to you for another round? Good biddability. In contrast, does the pup drag the toy as far away as possible? Lose interest when you have the rag in your possession? Avoids touch while biting? Gets weaker, or shallow, the more you encourage? Re bites, or adjusts AWAY from you? And when you release the rag, he immediately takes it as far as possible away from you, under a table or chair? Not much biddability. I LIKE possession. The pup that takes and goes is fine. I am referring ONLY to his behavior while engaged, Taking possession is not the same as removing himself from you. A good amount of possession is necessary, but again, too much is not great. That will be a dog that works for the ball, but not for you. A pup that gets the toy, then either tries to re engage you is high on biddability, the pup that settles down quickly with his prize while dealing with you well during the engagement is medium, and the bottom of the ladder is the dog who cares deeply about the toy, but does not enjoy engaging with you with it. As with all drives, or behaviors, if a pup has too much of what I call biddability, it will be too soft to the handler. Softness means that the dog cares so much about NOT getting in trouble, it chooses to not act at all, or go into a default (like an automatic sit) when confronted by a choice. Some is good, too much is a nightmare. This dog is “too emotional” to be counted on in a life threatening situation. A dog with too much of this is very suited for a library reading dog, a therapy dog for visits to the nursing home and hospital, and a pet for older folks. In an application where the dog must disobey commands (as in P.T.S. assistance dogs) biddability is NOT chosen for. We want a dog that is bonded, but one who stubbornly insists on doing what it’s trained to do, regardless of its handler in some cases. Often, the assistance dog with a P.T.S.S. handler must continue to engage, to “bother” the handler to make him or her aware that they are reacting to their environment, even if the handler doesn’t recognize it. So, understanding that in many applications, the ability for a relationship with the handler is a positive asset, I continue to test for, and value “Biddability”. I’m using the term “social aggression” to mean aggression within a pack, or a social group. It can be a form of territorial aggression, as well, if it happens only on the home ground of the dog, but true social aggression is within the pack or group, and is not determined by location. As we all know, dogs are hierarchal in nature, meaning that there is no democracy in dogs. There is a clear pecking order, and that order is to be maintained regardless of stimulus. In fact, stimulus may cause the order to be re-established. Example #1: Two dogs are in their fenced in back yard. They are stimulated by a visitor, either human or dog, that enters the fenced in area. Almost immediately, the two original dogs will interact in a way that maintains their order… the dominant dog will make sure that he/she is the first to the new dog, for example. If the non dominant dog runs past the dominant dog to greet the visitor, that could trigger the dominant dog to attack the subservient dog. This is not always the case, of course, and order can be maintained in many different ways. Some dogs choose sleeping areas, other feeding areas. Some dogs have no inclination or drive like this. In social packs that include people and dogs, the same can be seen. Example #2: A mature dog is in a family of people that have had a child. The dog appears to be very protective, and “good” with the child. However, as the child starts to crawl, or stand, the dog may feel it’s totally ok for it to discipline the child, as if it was a young pup in the family. A puppy taking a discipline bite to the face may verbally complain (yelp, cry) for a bit. A child getting the same treatment is going to need to see the doctor. In starting with an older dog, it is not uncommon for the dog to sort out the family by size, stature, providing food, sound of voice, eye contact. So an adult dog coming into a family with a large male human and a much smaller, female human may certainly think that he is below the large male, but is above the smaller female, especially if the female is much more attentive to the dog. If you fawn over, cuddle, pet and fuss, it can be read by a dog as supplication, much as a young pup bothers older dogs by licking their lips, crawling under them, actively showing submission. This can lead to the dog thinking that he can “correct” the smaller human for what he believes are undesirable behaviors. 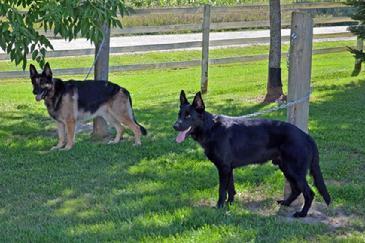 When a dog is with his pack, and another person or dog enters that pack, it is normal for the dog to alarm when the person or dog is first seen. This dates back to very old behaviors that were very much desired when the dog accompanied large groups of humans. The dog alerted to any stranger approaching, anyone that was outside the group. This behavior can be seen today when a group of people and dogs are camping together. Everyone is getting along, sitting around the campfire. One human gets up to go to the restroom. Upon returning, the entire packs of dogs react, barking, challenging the person who was just there. This behavior can be troublesome, however, when the dog has not accepted all the family members in a group, or has bonded more strongly with one person and not the others. The dog that is bonded to the husband, for example, is absolutely fine when he comes home from work, and the dog is alone. The dog may be fine when the wife comes home from work, and the dog is alone. BUT, when the dog and the husband are home, and the wife arrives AND the dog views her as ranking in social position UNDERNEATH THE DOG, she may be greeted with growling/challenging behavior until the dog feels that she has acknowledged her place in the pack. If you notice this behavior, you must change the dog’s reaction before it becomes ingrained. If the dog is not behaving in a friendly, subservient way with everyone in the family, the corrections must come from the dominant person, not the subservient one. It is not wise to simply correct the dog, because that doesn’t change his attitude about the person as a whole. Coming Home. Do not allow the subservient person to enter the home with the dominant person IF THE DOG IS LOOSE. If the dominant person is home, he/she should either greet the homecoming human by physically smiling, greeting by voice, hugging, inviting the person to come in, basically. The dog should be allowed to see this behavior as positive. It may be necessary in the beginning to tether the dog back from the door, or to crate the dog when the person comes in. If the dog is tethered, or crated, the subservient person should be the one that lets the dog out, or off the tether, and that should happen after the person has been in the room for a bit, any energy from other dogs should have dissipated, and there is a sense of calm in the house. If the subservient person feels at all threatened by the dog, he/she should NOT approach the crate, or dog until they feel completely comfortable with the dogs behavior. Vehicles. The subservient person should get in the vehicle, and then the dog should be told to get in. Each time the subservient person leaves the vehicle; the dog should be taken out, and only allowed back in after the subservient person has gotten in. Laps, bed, couch. If the dog and dominant person is on the couch, or on the bed, the dog should be told to get “off” by the dominant person BEFORE the subservient person approaches. The subservient person should not attempt to pet, stroke or touch the dog while it’s on the dominant persons’ lap, or sleeping next to the dominant person. Much of this may sort itself out without much ado. This is usually a problem when the dog is first acquired, however, I have seen this happen when a family puppy grows up, and then becomes the dominant persons’ service animal, or a police K9. The special bond that happens between the service or K9 dog and its handler can trigger this social aggression. The age of the typical dog that starts this behavior is around a year and a half, and will continue to strengthen until the dog is three. I have not seen any benefit to neutering in this situation. Interact affectionately with the subservient person while the dog is present. Defer to the person, meaning, get up and move away from the couch, and have the subservient take your place on the couch. If the dog reacts to the subservient in an aggressive way, correct the dog by voice, but think disappointment, not aggression. More like “Don’t you DARE do that; what is WRONG WITH YOU?! !” but make sure the dog knows you are talking to HIM, not to the subservient. Look him in the eye; turn your back to the subservient, basically focusing on the dog while ignoring the subservient. If the subservient is a child, it is VERY IMPORTANT to not discipline the child for its behavior in front of the dog. So, if your child forgets and comes into the room with the dog loose, and triggers the dog, necessitating a correction from the dominant, DO NOT chide, scold, or punish your child immediately. That will make the dog believe that the child was the transgressor. Even if the child was, you can explain what he/she did wrong later. Again, DO NOT YELL OR CHASTISE YOUR CHILD IN FRONT OF THE SOCIALLY DOMINANT DOG. TRAIN THE DOG IN OBEDIENCE. It is important that the dog listen to and accept the dominant in everything. Force the issue if you need. Many dogs would never dare insert themselves above a human, so you already know you have a socially dominant dog. By setting understandable boundaries, teaching the dog to stay, sit and heel are all basic skills that show him that you truly are in charge. If you are in charge, he will listen and follow your lead. Try as often as you can to show that you want the other persons in your family to be there, by acknowledging them when they come into the room, by moving toward them, smiling, and speaking. Don’t fuss over the dog. This cannot be overstated. By cooing, petting or stroking you are moving yourself underneath the dog. You are acting as a subservient young dog, and are being treated as such. Simple commands, understandable requests, and getting the dog to earn your praise is your goal. Remember to set up the dog to win, meaning communicate with the dominant about what you are going to do. Remind the dominant that it’s their job to think ahead, just as you do. When entering the room, come in boldly, do not sneak, or slow down. You belong there, and you have to act like it. Take over all feeding of the problem dog. Remember that the trouble starts when you enter or leave. That means the yard, a vehicle, or a room. Even in your own house, you will have to be aware of this reality. This is probably not going to be forever, but it can take a very long time. 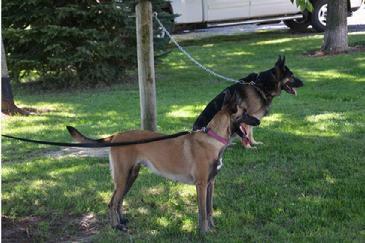 Being able to "stand tied"; a life skill for your dog. Much has been said about never tying your dog out to his dog house, or simply tying him in the back yard. It is rarely a good idea. The dog can be attacked by other dogs, or animals. He can get tangled in such a way that he can’t reach his water, or shelter. He can be approached by strangers, and if he bites them, you are on the hook. So, as a matter of daily living, a dog should not be tied. Being ABLE to be tied, though, is a life skill, a temperament test, and just all around good for your dog. I find that many dogs that are badly leash trained can be “fixed” by simply tying them to a tree, under supervision, and letting them work it out. A couple of caveats, though. Obviously, don’t use a slip collar (also known as a choke chain) or a prong collar on the dog being tied. A good, stout leather collar is preferred. Never use an adjustable “clip” collar, and make sure that the collar fits properly so that the dog cannot slip it over his/her head. Many people do not fasten the collar tight enough. It should NEVER be able to slip over his head, even in a panic mode. If it’s on so loose that he can pull free, you can lose your dog in an emergency. Two fingers loose is the best measure. I make sure that I can get two fingers between the collar and the dog’s neck, but not anymore. Chain or Cable? I like them both. Some people really dislike a chain, but I haven’t heard a great reason for it. Worry about it tangling, or somehow injuring the dog seems to be the greatest concern, but a cable can wrap just as tight, if not tighter. Worry that the dog will break his teeth chewing on the chain is misplaced, as well. Dogs will bite and chew on a cable much longer than on a chain. The chain simply doesn’t offer good purchase, or good “mouth feel” to the dog. Always chose a large chain, or large cable. The smaller cables can really scar a dog if it wraps tightly, but remember, we are not leaving the dog unattended. When tying your dog for the first time, short is better. I have tie out chains scattered about our property for just this activity. They are bolted to full sized cedar fence posts, and vary in length from about two feet to about 4 feet. Even a very busy dog can figure out how to unwrap himself if he only has a couple of feet of chain or cable to deal with. Bring your dog to the secure tie out, snap on the tie, walk him/her out to the full distance of your chain/cable, and simply walk away. I usually say “you’re tied” to the dog, but at first, they won’t understand. If you don’t walk them out to the end, they may bolt, and hit the end very quickly, causing a panic. A client of mine, who fancies sight hounds, will not tie her dog because she is worried that the dog will break its neck if it sees a rabbit. For this purpose exactly, use a very short chain or cable. Do not allow the dog running room. Walk away, and watch from an area that allows you to see your dog, but your dog can’t see you. Watching from a window is great. What does he do? Rage and pull on the leash? Stand with it as taut as it will go? Circle madly? Stand absolutely still, as if frozen in time? Or simply accept that his world is a bit smaller right now, and move calmly about his area? The best result of this exercise is the latter. If the dog understands the leash and collar completely, he will not “freak out” when tied. If he doesn’t, well, this is how you train it. Wait until some progress is made, whether he stops pulling, or moves into the post and learns to relieve the pressure on his neck from the collar, or in the case of freezing, starts to move about. This can take an hour, or ten minutes, depending on the age and temperament of your dog. Obviously, a younger dog learns this much faster than an older or spoiled dog. After you have your dog accepting the fact that he is tied in one location, make sure you vary your tie out area. You will find that this life lesson helps you in a multitude of ways. He will stop pulling back on a collar when you are trying to move him forward. He will stop resisting if you need to take his collar to help him get into a vehicle, or up on an obstacle. He will be much easier to teach to heel, if using a choke or prong collar technique, because he’s already trained to “give” to the collar. It is an important life lesson, so don’t miss out! 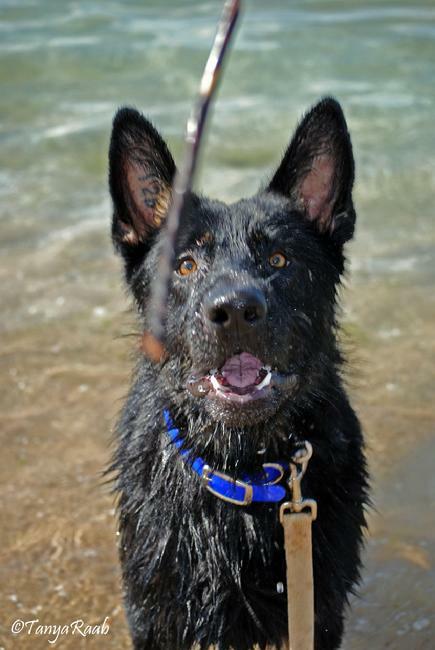 Photographer Tanya Raab captured the innocence and wonder of her German Shepherd �Pagos� as he gazes at the most amazing stick in his world! In today’s heavily scheduled and task orientated world, we humans don’t take the time to “poke around”, let alone allow our dogs to do so. What I’m talking about is just being in our environment… looking, smelling, investigating, inspecting. Exploring is a very necessary skill. Dogs are born with curiosity. They start to investigate their surroundings as soon as they are able. The acquisition of information is paramount to the development of their social skills, environmental soundness, and ability to focus when novel distraction is present. So BEFORE you start your super star pup on bitework, or nosework, or any other “work” we want to do, make sure he is allowed to “poke around” in new places. Let him explore and sniff, touch or lick what he finds in new places. Don’t make him heel, or sit, or do any passive behaviors. Let him LEAD YOU where he wants to go, and watch without interfering as he learns. You will be able to learn about him as you are doing this. How long is his focus? Does he use one sense more than others? What does he do when he is startled? How long does it take him to recover? All these things will be valuable when you DO ask him to learn something you want him to learn. While you are at it, take some time for yourself... how does the wind change his focus? What do you smell? Did you even know that little toad was there? Focusing on what he is focusing on will make you more aware as well. When I am working with an adult dog in any form of training, the WORST student is passive, sullen, unwilling to offer behaviors. I believe that dogs become that way because of early stifling of “poking around”. The dog has been conditioned that seeking out information is punished. Of course, we need to interfere when the dog sticks his nose in our crotch, or knocks a child down while smelling his breath, but a dog that is consistently punished for “not behaving” in novel situations without allowing some seeking/gathering behavior will become introverted, and will shut its self off from the outside world. A good example of this happened recently when a person brought me a young German Shepherd, five months old or so, for an evaluation for an upcoming class. As we sat in my kennel office (clearly a “dog place” full of doggie smells) I asked them to remove his leash to let him "be free". The interior door leading from my office to the bathroom and grooming room is just about always open, as that is where the air conditioning unit is located. The dog went through the open door and the owners immediately became agitated, scolded their dog and insisted he come back to them, and then commanded him to do something boring like sit or lie down. When I ask the owners “Why do you do that?”, they become confused and acted as if the dog did something wrong. It’s that idea that when a dog is exploring, he is not “listening”. What is wrong with him not “listening” at that moment? I would be tickled if my upcoming personal prospect pup was bold enough to do that in such an intriguing place. I’m not as happy if my pup lays quietly at my feet, not willing or able to go poking around. At this age, the outgoing, inquisitive, bold pup is what is proper. So, next time you have a little time to “work” with your pup, go somewhere and “poke” around. Spend more time with him doing this when he is young. There will be plenty of time to train, to teach, to control him. But, if he’s allowed to learn to WANT TO LEARN, and know that we encourage it, our job will be so much easier!